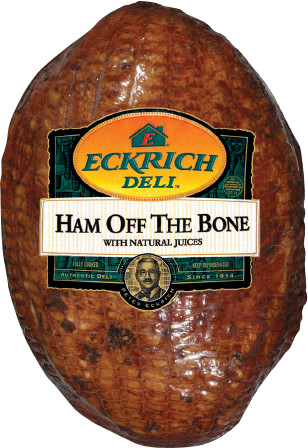 Eckrich Ham off the Bone has premium flavor because it has all its own natural ham juices. We start by cooking this ham on the bone, so it gets all the delicious flavor of bone-in meat. Then we get it ready for you to order sliced at the deli. We also make our deli meats without by-products, artificial flavors or colors, gluten or soy. It’s the perfect way to get full ham flavor, no bones about it. Ingredients: HAM CURED WITH WATER, CONTAINS 2% OR LESS OF SALT, SUGAR, POTASSIUM LACTATE, SODIUM LACTATE, SODIUM PHOSPHATES, SODIUM DIACETATE, SODIUM ERYTHORBATE, SODIUM NITRITE.